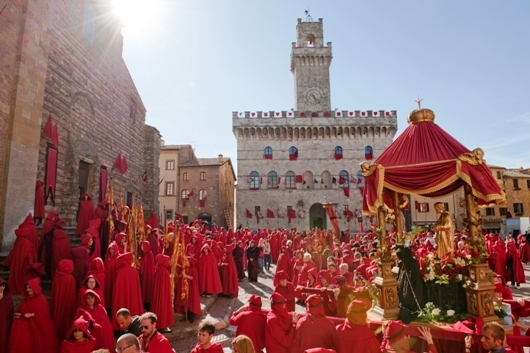 “Here is Volterra!”, says Alice Cullen on board of the yellow Porsche, as soon as she sees the Tuscan village, seat of the Volturi. Actually, that village with narrow streets that go uphill is Montepulciano. This tour will allow you to discover the Italian film set of “New Moon – Twilight Saga”, accompanying you on a visit to the more or less known sites of the town, which have been the setting of some overwhelming scenes of the film. The palace with the clock tower, Piazza Grande filled with red cloaks, witnessed the desperate rush of the young mortal Bella Swan, looking for her charming good vampire Edward Cullen. Along with a guide, you will walk through the historic center of Montepulciano, where you will recognize Vicolo della Concordia, Piazza delle Erbe, Piazza San Francesco, and much more. At the end of the tour, stop at a historic restaurant in Montepulciano, for a very special aperitif.